Details of any events that are planned as part of one of our Projects or as a Fundraising opportunity will appear on this page. Continuing our work with people who live with dementia, or who experience isolation for any reason, we have joined forces with PKAVS again to put on a second 'A Trip Down Memory Lane' Tea Dance event for unpaid carers and the people they care for. The event will take place on Wednesday 12th September 2018 from 2pm until 4pm at McDiarmid Park (Centenary Suite), Perth - Tea and delicious cakes will be provided. We would like to extend a huge THANK YOU to all of those who participated in our recent Blue Run. 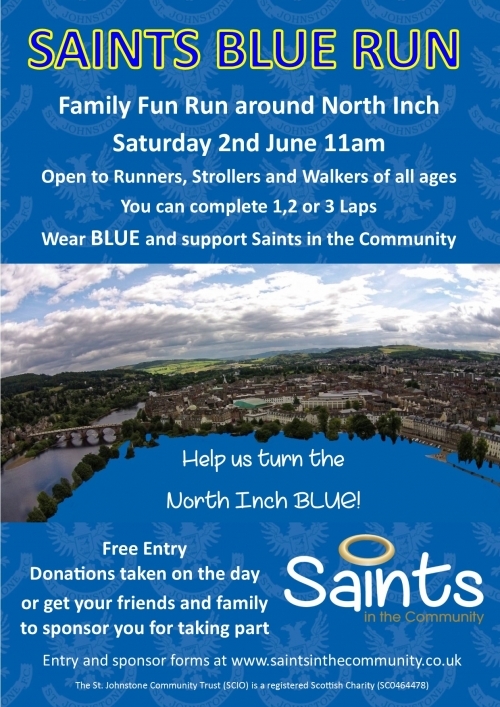 Saints in the Community staged a fun run around the North Inch in Perth, on Saturday 2nd June to raise funds for the Community Trust. Aimed at runners, strollers and walkers of all ages, participants chose to complete 1, 2 or 3 laps of the Inch. We can now announce the total amount raised was... £1,549.53!! We are very grateful to all of those who took part and we hope you all had a fantastic day with us.